By now, it’s safe to say that the only women who benefited directly from the Latin American literary boom of the 60s and 70s were the wives of those writers who found themselves suddenly popular across the globe. It also might be safe to say that Latin American countries, following the suit of most others (U.S. included), has been unkind to their writers of the female gender — ironic really, given how many of its writers count their madres and abuelas storytelling as major influences on their writing. (Gabriel Garcia Marquez attributes the deadpan style he brought to his magic realism to that of his grandmother who raised him on stories told in a way that Marquez called “brick-faced.”) If we take a quick look at a list of writers who became prominent during this period in a way few Latin American writers ever had before, we find a handful of today’s literary-household names: Julio Cortazar, Maria Vargas Llosa, Carlos Fuentes, and of course the aforementioned Marquez. The list of lesser known writers though not lesser talented (Jose Donoso, Juan Rulfo, Manuel Puig, etc.) is also a boy’s club. But women weren’t the only group that saw little rise in readership during the boom; Brazil, as a whole, received very little recognition. Fernando Sabino, Erico Verissimo, and Jorge Amado were all neglected. (Jorge Amado would eventually break into the translated world, unlike Sabino and Verissimo both of whom have no translated texts in print in America today.) The reason for this neglect may be rooted in language. Portuguese and Spanish, though both West Iberian Romance languages and therefore mutually intelligible, do have their differences. Maybe it was an issue of finding the right translator. Whatever it was, it is important to note, because finally, despite language issues and patriarchal attitudes, this year, Hilda Hilst has, for the first time, been published in book form in English for an American audience, an audience one can only hope will embrace her. 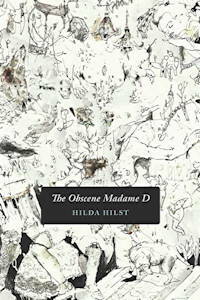 This publication of Hilst’s The Obscene Madame D by Nightboat/A Bohla, originally published in Brazil in 1982, may just be the literary miracle of 2012. Hilda de Almeida Prado Hilst’s story is one of both local and international neglect. She was born in Jaú, Brazil in 1930. Her publication history reads like a chronology of formal shifts: in the 50s she began publishing poems, in the 60s she worked almost solely in the theater, and in the 70s and 80s she published novels. She managed to win a major award in each form; in ‘62 she won the Prêmio PEN Clube of São Paulo for her book of poems Sete Cantos do Poeta para o Anjo; in ‘69 she won the Prêmio Anchieta for her play O Verdugo; in ‘77 she won the APCA best book award for her Ficções. But accolades don’t always bespeak popularity. Hilst remained a figure of the underground. In 2005 an important text titled Brazilian Writers was published in the states as volume 307 in the Thomas Gale collection “Dictionary of Literary Biography.” Each entry focuses on one author, listing their publications and providing a short biography of their life and character. The only way to make it into this book is if you have a scholar working on your papers. Hilst, not having one, was left out. A reading of Hilst’s The Obscene Madame D may be the best explanation for this. In the book, not only does Hilst challenge all the rules of fictional form, but she manages to completely deconstruct the power hold of the patriarchy, while at the same time drawing the text closer to the female body than even some of the most feminist works written to date. She is what one might call a difficult writer, which is unfortunate because reading her isn’t that difficult at all. The plot — a more appropriate word might be timescape — of The Obscene Madame D is a conversation that takes place between Hillé, from beneath the stairs, and Ehud (presumably Hillé’s husband), from on the stairs. A year before Ehud died (although in death he manages to be very much alive in the novel), Hillé, the -agonist of the text, moved into the “recess under the stairs.” She begins by telling us that she has seen herself “removed from the center of a thing,” a thing she doesn’t know how to name. This detachment from the center, this psychic break, sets the conversation in motion. We come to learn, only later, the real impetus for this talk with Ehud is that Hillé, “the incestuous theophagite,” has become afraid she is dying and has decided it’s time for a settling of accounts. The tone is one of reflective-inquisition, a series of what-abouts. What about this, what about that. Why this, why that. She is searching for answers. Ehud, who, in typical male-fashion, would rather have her making him coffee, attempts to coax her out of her cubby: “Do you hear me, Hillé, listen, I don’t want to upset you, but the answer isn’t there, do you understand? neither in the recess under the stairs nor on the first step here, at the top, do you really understand that there is no answer?” Luckily, this isn’t true. The book, which is saturated with questions, is itself a kind of answer to one of the more important questions in literature today. If woman has always functioned “within” the discourse of man, a signifier that has always referred back to the opposite signifier which annihilates its specific energy and diminishes or stifles its very different sound, it is time to dislocate this “within,” to explode it, turn it around, and seize it; to make it hers, containing it, taking it in her own mouth, biting that tongue with her very own teeth to invent for herself a language to get inside of. The hours. Ecstasy. Dryness. Stung before the outdoors, I lapped the air, colors, nuances, and I stopped breathing before certain ochres, the veins of certain leaves, before the smallest of leopards, before the gray-white feathers that fell from the roof, gray of a stony gray, a shimmering silver-gray, and having seen, having been what I was, am I this one now? How can I have been Hillé, vast, and plunging fingers into the matter of the world, how having been, can I have lost she who was, and be today who I am? Ehud reached with his left hand, drew the sword from his right thigh and plunged it into the king’s belly. Even the handle sank in after the blade, which came out his back. Ehud did not pull the sword out and the fat closed over it, and the refuse came out. Every time Hillé removes the power from her version of Ehud, whose main worry is that they may “never screw again,” she does it with a question. Men of power hate questions. There is certain strength the inquisitive has, and Hilst proves this truth in the text over and over again. The questions pull the power from men and place it in the middle of the room. That seems to be the point: Give power to no one. Let us be people, man and woman, different but powerless all the same. Woolf tells us that the female writer’s “book has somehow to be adapted to the body, and at a venture one would say that women’s books should be shorter, more concentrated, than those of men . . .” She tells us this because women are forever being interrupted at their work — like in the old saying “a woman’s work is never done.” But what if a shorter length, coupled with a concentration of ideas, served another purpose? What if we looked at them as their own form? The Obscene Madame D stands at only 57 pages and yet manages to offer the reader a truly immersive experience unlike any of the classic tomes that brim with words. With Hilst we get not only the conversation, the incessant questioning of her inner and outer life, but also her symbolism. Her text has depth rather than length, another attribute that may be, in a certain sense, female. She speaks of being a sow and of giving birth to the Porcine Child. In many cultures, the sow has been seen as the Great Mother suckling her litter of piglets. And again, we’re back at Cixous who says that “Even if phallic mystification has generally contaminated good relationships, a woman is never far from “mother” (I mean outside her role functions: the “mother” as nonname and as sour of goods). There is always within her at least a little of that good mother’s milk. She writes in white ink.” Hilst writes in white ink. The symbols don’t stop at the sow. One can find them littered throughout the text, which only adds to the desire to reread the work. Of course, it’s important not to pigeon-hole Hilst’s writing. Much like the great works of feminist literature, with Hilst, we are talking about a literature capable of transcending gender, offering up worlds and ideas we need all experience. What those who don’t quite grasp the concepts of feminism fail to understand is, feminism is working to help all of us evolve. All. Of. Us. In the middle of The Obscene Madame D, Hillé says “I would have loved Franz K, we would have laughed together. . .” And they probably would have, but if they did, we would be able to hear something distinct in Hillé’s laugh that wouldn’t be there in Kafka’s. For when Hillé laughs, she laughs the laugh of the Medusa. Now, thanks to Nathanaël’s wonderful translation, more of that laughter can be heard here in America.